This Sunday, if you find yourself up between 8 and 10 a.m. please tune in as I guest host the Garden Hotline (in NYC and surrounding areas it is on WOR AM710 Talk Radio). 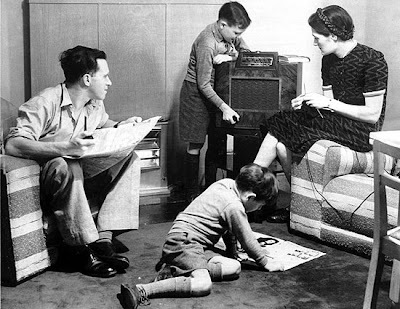 I will be filling in for the venerable show's host, Ralph Snodsmith, and answering callers' questions for both hours. I got a nice comment from Lauren at The Fern & Mossery yesterday so I went to check out her blog devoted to all things terraria. It's full of more news and inspiration than you could imagine would fit into the limited space of a glass container. 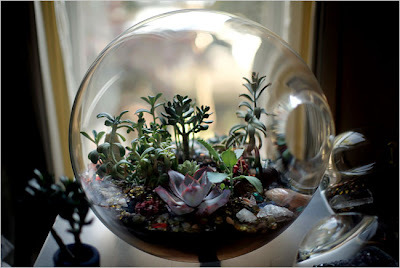 There is a big world of terrariums out there. Take a look for yourself! Look what's been hiding in one of my terrariums. 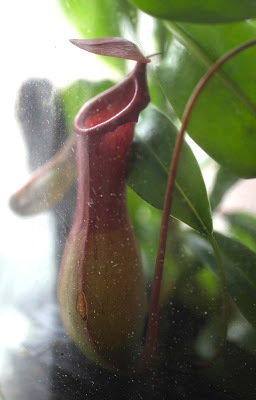 I bought a small nepenthes (tropical pitcher plant) at the Brooklyn Flea this past February and planted it in a lidded glass jar. A successful terrarium seems to have a diurnal cycle. They kind of fog up and even "rain" a little in the cooler morning and evening and dry out as they heat up in the daytime. My plant seemed very happy with this weather since it was putting off lots of new leaves so, as you do with terrariums; I kind of forgot about it and didn't open the lid for months. The other day I opened it to replace some moss and was surprised to find one 5-inch pitcher and two baby pitchers had formed and were hiding among the leaves. Nepenthes are native to the jungles of Southeast Asia, India and Australia with the biggest concentration occurring in Borneo and Sumatra. They've been called monkey-cups because monkeys are reported to drink rainwater from the plant in the wild. The plant produces its own viscous liquid that forms in the base of the pitchers (even my never-watered pitchers have it). This juice helps trap, drown and even digest insects that venture over the lip of the pitcher and slide down its waxy throat. The genus is named after nepenthe, a potion mentioned in Homer's Odyssey that makes one forget one's sorrows. 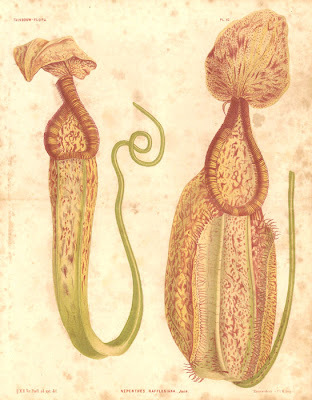 The plant was first described in 1658 by a French colonial governor in Histoire de la Grande Isle de Madagascar. Below, a newly formed cup grows in my terrarium. 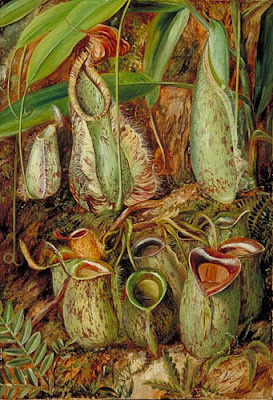 Below, one of 19th-century botanical artist Marianne North's eccentric paintings of a nepenthes. If you are in London, visit the special gallery that houses 832 of her botanical artworks at Kew. 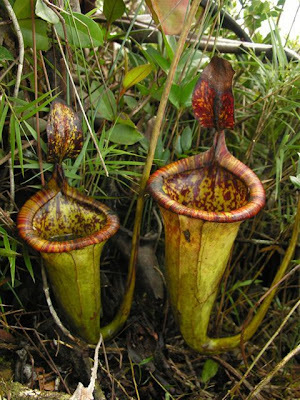 Recently, a giant nepenthes (Nepenthes attenbouroughii), seen below, was found in the Philippines by some missionaries who got lost in the mountains while trying to install a radio tower (I would wager it wasn't going to merely broadcast Lite FM...). Once rescued, they reported seeing hundreds of the alien-looking plants and their location to scientists who returned to catalog them. I find the combination of misguided missionairies and previously unknown mammal-eating plant species irresistible. These pitchers grow up to 4 feet in length so not quite adapted for trapping lost proselytizers yet—but hey, evolution works in mysterious ways. Here is a fascinating video from the Planet Earth television series showing a more common nepenthes in action. Coincidentally, Sir David Attenborough, the namesake of the new species, narrates this eerie tale of carnivorous plants and scuba-diving spiders. My wonderful friend and urban flower farmer, Tara Kolla (above and below) at Silverlake Farms, sent me a request to put out the word about a very long-ranging problem that urban farmers are having in Los Angeles at the moment. For a number of years, Tara has grown exceedingly beautiful sweet peas, ranunculus and other flowers to sell at farmers' markets in Los Angeles. Many of you will know her and recognize her contagious enthusiasm for organic growing practices. Lately, she has been thwarted in her efforts to grow flowers at her Silverlake home and sell them by an antiquated city ordinance (see below). In fact, the city has forbidden her from doing it. I hope any Los Angelenos who read this blog will show their support for Tara and urban farmers across their city. "PROBLEM--In 1946, a Los Angeles municipal code known as the Truck Gardening Ordinance was written to allow the growing of vegetables in a residential (R1) zone for sale off-site. What this means, however, is that it is prohibited for city dwellers in R1 zones to grow fruits, nuts, flowers or seedlings and sell them off-site - at local farmers’ markets for example. Furthermore, no one at City Hall can agree on what Truck Gardening is. We think it’s time for the City of Los Angeles to come into the 21st century and amend its municipal code to support the burgeoning urban farming movement. It’s time L.A. legalized urban farming in R1 zones as part of its commitment to greening our city. A group known as Urban Farming Advocates – Los Angeles, has named this motion the Food & Flowers Freedom Act. We’re asking for your support so that City Hall will change the law quickly and let L.A. become a leading center for urban farmers. Urban farming provides access to more local, organic, affordable, fresh and nutritious food. In this time of economic crisis and rising food prices, urban farming can help create green jobs and stimulate the growth of artisanal home-based businesses. Urban farmers help build community bonds and bring a truly local flavor to farmers’ markets. Angelinos care deeply about buying local organic produce. What about flowers? According to the California Cut Flower Commission, 80% of the flowers we buy are imported from overseas. Imported flowers are not tested for pesticide residues. Let urban farmers meet the rising demand for fresh, local, organic flowers! Urban farmers can meet the needs of people for more locally grown, sustainably raised, pesticide-free food and flowers. We have the climate; we have the space. What we need are contemporary laws. To find out who your local LA councilmember is, look here. A few weeks ago, I was asked to be one of the judges for the Greenest Block in Brooklyn Contest, an excellent program sponsored by the good folks at the Brooklyn Botanic Garden. Over 1,200 blocks have entered the contest since 1994. During the course of a very rainy Tuesday we looked at eight or so of the semi-finalists for the hotly contested prize. Several teams of judges were involved with the judging over a period of weeks so I had no idea if our top rated garden block would win. But it did! First place goes to the Lincoln Road R&B Block Association for Lincoln Road between Rogers & Bedford Avenues, photo above, in the Lefferts Gardens section of Brooklyn. I was rooting (sorry!) for this block since it really showed a street in transition. Some of the gardens there are chock full of plants and flowers while others remain untended or even just a slab of concrete. 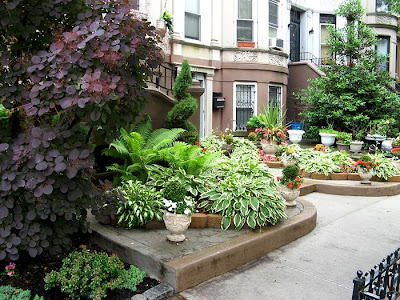 But what is evident is the passion of the gardening leaders on the street who have taken over disused sidewalk squares and street tree beds as well as their own front yards and turned them into verdant showpieces. 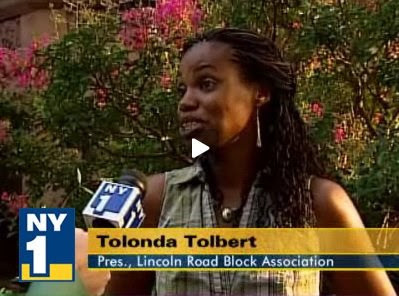 Under the leadership of block association president, Tolanda Tolbert, you can see the horticultural enthusiasm spreading and with it comes a collective neighborhood pride and the rejection of long-standing crime and neglect that have plagued some of these streets in past years. I only wish more parts of the city would join in the contest. Queens are you listening? I also loved meeting the proud gardenmakers at East 25th Street Block Association in East Flatbush who have won the contest twice before. I won't forget how the ladies of the block came out to talk to us and show us their front yards and tell us how the horticulture bug has spread from a few houses to cover almost the entire block. There are still a few non-gardening holdouts on the street and I pity the withering looks these residents must suffer from the garden group as they come and go from their barren lots. And you can bet there's no sneaking around, these ladies are always outside in their gardens. My fellow judges were Allison Mezzafonte of AOL Living & Home, garden design and blogger Marie Viljoen of 66 Square Feet, and garden designer and Director of Communications at the Brooklyn Botanic Garden, Leeann Lavin. They all remained remarkably sunny companions on our soggy tour. Thanks to Robin Simmen, Director of Brooklyn GreenBridge, for being our guide and chauffeur. See a report on the contest and the winning street here on NY1.